With the sun and warmer weather in Cleveland, thoughts are quickly turning to “get out of the house” activities for the kids. Being cooped up all winter, it’s time to get out and enjoy some summer type fun. But what do you do if by the weekend the temperature has crawled back into the lower digits again? Where can you go to get some great photos of the family and have the kids really enjoy themselves? Luckily, within a four hour drive from Cleveland, there are numerous water parks just waiting for your family. Closest is the Kalihari Resort in Sandusky, OH. 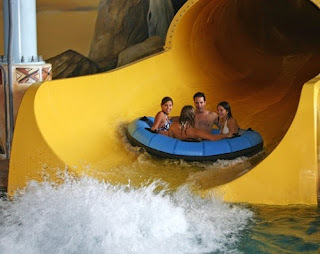 With over 173,000 square feet of wild water activities, this is America’s largest indoor waterpark. Wax up your board and surf indoors 365 days a year or try one of their other many attractions. Get out and enjoy some post-winter water fun.